About the Series: Heal yourself and others! Aromatherapy and essential oils are very powerful tools in natural health and healing. Take a whole-body approach and learn how to personally and professionally use aromatherapy for holistic health and mental, emotional, physical, spiritual, energetic, and metaphysical well-being. Aromatherapy blends well with massage, bodywork, energy work, acupuncture, yoga, healing, counseling, nursing, Western Health care, meditation, TCM, Ayurveda, and naturopathy. This comprehensive 110 hour online Level I aromatherapy series was created by Holistic Health Consultant, Certified Aromatherapist, Herbalist, Master Gardener, and American Botanical Council member Dr. Christina Wilke-Burbach PhD, RMT, CA. Dr. Christina has training in both “French” aromatherapy and “British” aromatherapy and teaches true Holistic aromatherapy…. safely and ethically using oils via inhalation, topically, and internally when appropriate. Level I provides the foundation and theory behind ‘Holistic Healing with Aromatherapy.’ A 300 hour ‘Holistic Healing with Aromatherapy’ Level II is available after completion of Level I. Level II is unlike any other one out there as it combines clinical, medical, folk, metaphysical, and intuitive aromatherapy with holistic healing concepts. Throughout the Level II series, you will learn over 40 aromatherapy and holistic techniques to bring balance to the mind, body, spirit, and energy system. Students also learn an Aroma Reading intuitive aromatherapy Technique developed by Christina. You may take the whole series without pursuing the certificate of completion! You may also just take the Aroma 101 class as comprehensive intro to aromatherapy. This series commits to the highest level of safety and ethics. Certificate: Students who complete modules Aroma 101-106 and required homework are eligible for a 110 hour Level I certificate of completion. Educational Prerequisite: None. This is an entry-level series. This Aromatherapy Program is designed to prepare students to become highly qualified professionals in the therapeutic and holistic uses of essential oils. Christina is an advocate of Integrative Medicine and strongly encourages medical professionals to consider taking these classes. Level 1 Certificate of Completion is required to take Level II classes. Timeframe: Timeframe is flexible and series is self-paced, but it is suggested that students try to complete the coursework for level 1 within 12 months. Please note: These are brand neutral classes. Dr. Christina does not advocate for any certain brand of essential oils nor does she sell any certain brand; she purchases oils from many different companies and currently has oils from over 12 different companies. There are a lot of really great companies out there. In professional aromatherapy, the focus should be on safely and effectively using the oils, not on fighting over what company is the best. In Aroma 101, she will introduce you to over 30 essential oil companies. She encourages the student to find the company or companies that best align with their philosophies. Aroma 102 introduces students to ways to make their own essential oils and infused oils. Supplies: Each module includes an 8 hour recorded class taught by Dr. Christina, a comprehensive workbook and extensive written materials. Essential oils are not included in the classes. Students are responsible for purchasing their own oils along the way. Some great oils to start out with include lavender, German and Roman chamomile, tea tree, peppermint, eucalyptus, lemon, grapefruit, ylang ylang, and bergamot. Some great carrier oils include jojoba, grapeseed, sesame, almond, and coconut oil. Students are expected to slowly build up their essential oils collection as they progress in classes. Many students have a good idea of what essential oils and carrier oils they would like to start purchasing after attending Aroma 101 and Aroma 102. There is a required book for the series that students must purchase before Aroma 102: Essential Oil Safety: A Guide For Health Care Professionals, 2nd Edition By Robert Tisserand and Rodney Young. There is also a Suggested book: The Complete Guide to Aromatherapy, 2nd edition by Salvatore Battaglia. Tuition: Each module (101, 102, 103, 104, 105, 106, exam/case studies/final consultation) is $99. You can either pay as you go or pay for the whole series for $500 (a $200 discount). You may register at the bottom of this page. Included with each module: Each module includes an 8 hour downloadable recorded class taught by Dr. Christina, a detailed 50+ page manual in PDF form, and additional written materials and exercises. Essential oils are nature’s holistic medicine and a form of Complementary and Integrative Health. Learn about the different categories of Complementary Health, what aromatherapy is, its history and modern development, how oils are produced, properties of the oils, carrier oils and their therapeutic properties, how to blend and safely use oils, techniques, and lots of recipes. You will learn about reputable companies and what to look for when purchasing oils, endangered oils, and using aromatherapy for self-care. We will discuss the professional aromatherapy organizations and their guidelines. We will also discuss integrating aromatherapy into your lifestyle and careers. We devote time to learning Animal Aromatherapy. This class is for anyone and everyone! 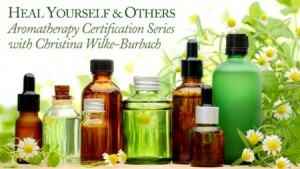 This is the prerequisite class for all other classes in the ‘Holistic Healing with Aromatherapy’ certification series. Take “Healing with Aromatherapy” alone, or delve deeper into aromatherapy with the whole series. Module includes 8 hour downloadable recorded class taught by Dr. Christina, a detailed 50+ page manual, and over 100 pages of additional written materials and exercises. Tuition: $99. Purchase at bottom of this page. This class offers students an opportunity to delve deeper into aromatherapy. We will profile 40 essential oils in detail, including each oil’s Latin name, genus, species, cultivation, production, botany, taxonomy, and holistic use (emotional, physical, spiritual). We will also cover essential oil testing, GCMS, adulteration, and quality of oils. Instructor will also discuss how to produce your own essential oils and infused oils. Module includes an 8 hour downloadable recorded class taught by Dr. Christina, a detailed 50+ page manual, and additional written materials and exercises. Tuition: $99. Pre-requisite: Aroma 101. Required book: Essential Oil Safety: A Guide For Health Care Professionals, 2nd Edition By Robert Tisserand and Rodney Young. Suggested book: The Complete Guide to Aromatherapy by Salvatore Battaglia. Class covers the science behind how aromatherapy works! Learn about the psychopharmaceutical and pharmaceutical action of essential oils and how they affect brain and body chemistry. Class covers how oils work, chemistry, psychopharmacology, pharmacology, properties of essential oil chemical constituents, the mode of action, and rates of absorption of essential oils. We also cover essential oil therapy contraindications and interactions. Module includes an 8 hour downloadable recorded class taught by Dr. Christina, a detailed 50+ page manual, and additional written materials and exercises. Tuition: $99. Pre-requisite: Aroma 101 and 102. Required book: Essential Oil Safety: A Guide For Health Care Professionals, 2nd Edition By Robert Tisserand and Rodney Young. Suggested book: The Complete Guide to Aromatherapy by Salvatore Battaglia. We will cover anatomy and physiology as it pertains to essential oil therapy and application. Systems covered include limbic, olfactory, lymphatic, immune, skin, respiratory, integumentary, reproductive, circulatory, nervous, endocrine, urinary, musculoskeletal, and digestive. We will also cover dis-ease and ailments of these systems as well as the best oils and techniques for each system. Students will be introduced to Psychoneuroimmunology (PNI). Module includes an 8 hour downloadable recorded class taught by Dr. Christina, a detailed 50+ page manual, additional written materials and exercises, and free access to an anatomy and physiology course. Tuition: $99. Pre-requisite: Aroma 101, 102, and 103. Nursing students and massage students with previous anatomy and physiology must still take this class as it cover this info as it pertains to essential oils. Required book: Essential Oil Safety: A Guide For Health Care Professionals, 2nd Edition By Robert Tisserand and Rodney Young. Suggested book: The Complete Guide to Aromatherapy by Salvatore Battaglia. Further explore the art and craft of blending essential oils and designing synergies! Enhance your ability to create effective, balanced, holistic, dynamic, and pleasant smelling therapeutic blends! In the best aromatherapy blends it is hard to pick out the individual oils as they merge together so well. This class will explore 5+ blending theories in detail and each student will create a therapeutic/clinical blend using each theory. We will focus on creating blends for sleep, stress, mood, pain, chronic health conditions, and unique client situations. We will work on ‘listening’ through our noses to discern fragrance characteristics and principle aromatic qualities. This is also an opportunity for students to present client cases for assistance with designing effective aromatherapy and natural health treatment plans. Students will also be introduced to perfumery and cologne basics and the fragrance wheel and will have an opportunity to practice creating a natural perfume. Module includes a 5 hour downloadable recorded class taught by Dr. Christina, a detailed manual, a detailed perfumes workbook, additional written materials and 3 hours of hands-on exercises. Tuition: $99. Pre-requisite: Aroma 101. This class will focus on developing a holistic business, with an emphasis on aromatherapy. This class will provide a strong business foundation for level 1 aromatherapists. In this professional development class, students are introduced to Holism, the Holistic Paradigm and The New Wellness Wheel created by Dr. Christina. We will also cover how to do a clinical aromatherapy session, client assessment techniques including tongue diagnosis and pulse diagnosis. We will discuss the referral process and working as a healthcare team with other professionals. Christina will mentor you on developing your client consultation and recommendation skills and will introduce you to Positive Psychology Techniques, The Stages of Change, and Motivational Interviewing Strategies. We will cover creating intake and informed consent forms, developing products and labeling, sales tax, and basic marketing skills. We will cover the Code of Ethics from NAHA and AIA. We will also discuss evidenced based aromatherapy, research, how to read and evaluate research, and where to locate credible resources. Module includes a 8 hour downloadable recorded class taught by Dr. Christina, a detailed manual, and additional written materials and exercises. Tuition: $99. Registration Info: Contact Dr. Christina with questions at mindsoulandself@yahoo.com or 608.393.7353. Payment in full is required before any class materials will be sent to you. All sales are final. Each module (101, 102, 103, 104, 105, 106, exam/case studies/final consultation) is $99. You can either pay as you go or pay for the whole series at once for $500 (a $200 discount). After payment is received, within 24 to 48 hours Dr. Christina will email class recordings, class workbook, and additional materials to student. Please note that the fee for the exam/case studies correction and final 60 minute consult with Dr. Christina is $99 and is due when you are completed with all homework and ready for certification. I began taking aromatherapy classes with Christina because I have always been interested in essential oils. I am a registered yoga teacher and have attended a few yoga classes where the instructor used oils during Savasana or diffused them in the room during class. I thought it would be fun to learn more about essential oils, so that I could use them in my classes. After the first aromatherapy class, taught by Dr. Christina Wilke-Burbach, I was hooked! I found all of the information and hands(nose)–on learning useful and profound. As the classes progressed, I began teaching a yoga class using essential oils that I blended. The response from my students was positive and they started to ask me if I sold my blends. This sparked the idea to create my own business and now, I create different essential oil blends and self-care products. I also offer aromatherapy consultations for those that are looking for an intuitive and personal approach to creating therapeutic essential oil blends. I am very thankful to Christina! Holistic Aromatherapy classes have opened doors for me both personally and professionally! I highly recommend the Aromatherapy Certification to anyone who is searching for a small class size, personal attention, lots of resources, learning opportunities in and out of the classroom, a comprehensive course curriculum, and having a very knowledgeable instructor who is dedicated to making sure you have fun and succeed. I always anticipated each class; I loved the thought-provoking class discussions, class activities, and of course learning about the healing properties of essential oils! Aromatherapy is without a doubt a staple in my business and personal life. Thank you Christina! ~Robyn P. LMT, Milwaukee, WI. Regarding Level 1 and Level 2 Aromatherapy with Christina Wilke-Burbach, Ph.D.… After taking both of the Healing with Aromatherapy Intensives Levels 1 and 2, I am impressed with the depth of knowledge that Christina has regarding these magnificent gifts of nature known as essential oils. It is unfortunate that they are not better understood for their medicinal properties, and are confused with perfumery and scented candles. The oils are the essential life-force of each of the plants and as such, have the medicinal properties of each plant. It is beyond aromatherapy into botanical therapy! These classes are not just about dispensing oils to work on something symptomatic in an individual’s body, but learning about the organic chemistry or the chemical composition of the oils, their uses and effect on the body. We covered safety precautions based on science and chemical reactions, and science-based ethical standards of practice. And considering all these factors, how these oils can work with an individual holistically by taking into consideration ALL that is going on with each person. It is a true form of individualized treatment! What you will learn in these classes far exceed the National Association for Holistic Aromatherapy (NAHA) requirements. “Her course work is amazing and thorough and is for every healing practitioner serious about working in a holistic way with clients and patients” ~Mary Laven, Executive Director of Wind over Fire Healing Arts Center, Rochester, MN.